Your annual conference is so much more than an agenda of sessions, speakers and networking events. It’s an exciting, energized community of attendees, where innovative ideas are shared and new relationships are forged. You go to great lengths to convey this excitement and energy on your event website and in your marketing and promotional materials. But the program booklet—as one of the last items checked off a meeting planner’s to-do list—often takes on a more practical and utilitarian format. This may be a huge missed opportunity. One of the first interactions attendees have with your conference is with the program guide. 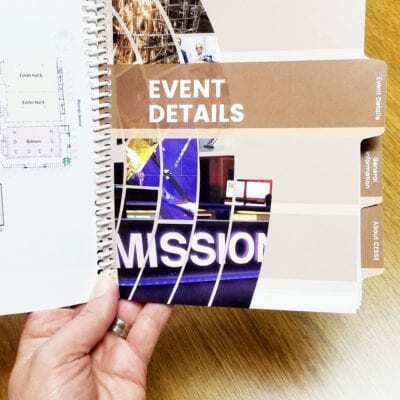 This booklet, while providing all necessary logistical information for attendees, also sets the tone of the meeting, and helps the attendee prepare for what’s to come. How are you hoping to engage attendees at your event? Do you want them to actively participate in sessions and interact with the content? Collaborate with speakers and each other? Do you want to challenge them or pull them outside their comfort zone? The design of your program book can help promote and facilitate these objectives. We’d like to give a shout-out to ASAE’s newest conference, Xperience Design Project (xdp). This event for meeting planners focuses on helping attendees re-think their own meetings and find new and innovative ways to deliver educational content. The branding and promotion of the event certainly communicated this. But as an attendee, I didn’t realize just how different this event was until I started paging through the program book when I first arrived. I could tell immediately this was meant to be a fun, energizing meeting. This extraordinary program book, designed by 360 Live Media, included design elements such as non-linear text, bold typography, graphic cues and on-page interactive elements, the xdp program book made it clear I was being expected to actively participate in my own learning. I was excited to be there even before the first speaker took the podium. The takeaway: it’s not just about delivering relevant information to attendees, it’s HOW that information is delivered. Challenge yourself to think about how you can present the schedule, session descriptions, speaker bios, etc., in a way that really makes a lasting impact on attendees and sets the tone for the event, getting them fired up before the first session. First and foremost, your program book needs to be easy for any attendee to navigate. Think of it as user experience (UX) for printed materials. Beyond that, here are six aspects of your booklet design to consider. There is a documented psychology behind font choices and how they trigger ideas and emotions. Serif fonts, such as Times New Roman, convey a feeling of class and heritage, making them appear formal. Sans serif fonts, like Arial and Helvetica, convey a straight-forward, simple and no-nonsense attitude. Modern fonts, like Futura, convey feelings of intelligence and chic style and have been reported to attract the attention of Millennials. The font choice you make throughout your program book should support the overall “vibe” of your meeting. Also, don’t be afraid to go big and bold with font size in unexpected places. This is a great way to provide an assertion of key ideas and themes that attendees will expect to hear, gaining their buy-in before the meeting starts. Within your brand palette, do you have any secondary colors that provide an interesting contrast? Use these colors to highlight key aspects of your meeting content, make a statement or direct attendees. Icons have emerged as a popular element of design, particularly on the web, because they provide quick and sometimes complex visual cues quickly while minimizing the amount of text needed. Incorporating iconography into your conference program booklet provides consistent visual cues throughout the book that help direct the reader. Depending upon the icon style being used, you can interject a bit of whimsy to make a more formal-looking program book feel approachable and conversational. One of the top trends in meeting design for the past several years has been providing a more interactive and collaborative approach to the learning process. Conferences are no longer a place for attendees to simply consume learning; they are active participants. Your conference booklet can help facilitate and promote this approach as well. Sure, providing dedicated pages to take notes is always handy, but can you take it a step further? Provide thought-provoking questions and space to answer them. Include short workbook-like activities in your program book. Or, give them a specific place to take notes about people they’ve met. One of our own fan-favorite program books features a simple, but impactful change from the previous year—we happen to know this because they are also one of our customers. The Council of Engineering and Scientific Society Executives (CESSE) incorporated tabs in their book to make it easy for users to navigate. Taking it a step further, they used what is often blank space to extend their event branding. 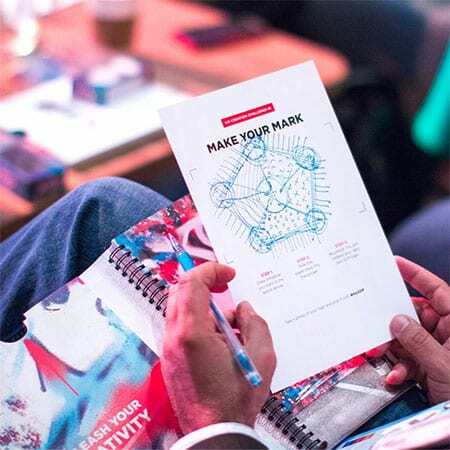 The flood of bold color and graphics on what is traditionally a blank page helped to reinforce the perception that this is a high-quality, professional conference. Some of the most cutting-edge event designs come from cutting-edge conferences, such as Adobe’s 99U and the Facebook Developer Conference. Take a look at how they are presenting program information and then see how you might be able to scale the execution to fit your audience. 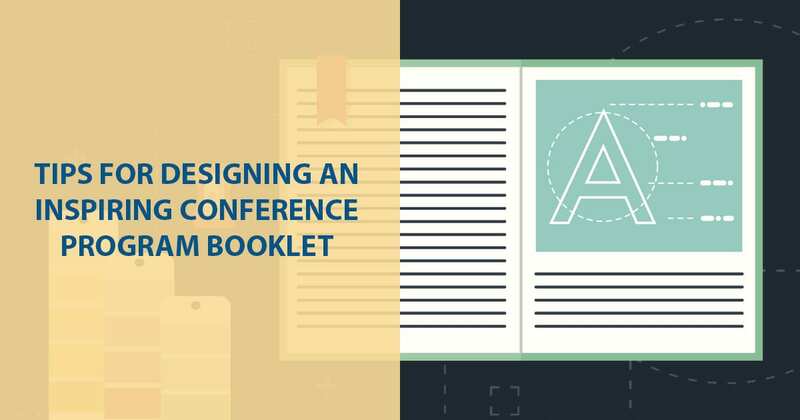 Your conference booklet can—and should—do more than simply provide logistical information. By incorporating a more inspirational design you can help shape the attendee experience well before the opening session begins.